I’ll apologize in advance for the noob questions. I don’t do this for a living...when I have machine work done I have to trust the machine shop knows what they are doing...but I still would like to have a better understanding of the whole process. Cylinder honing is one of those areas I have a rudimentary understanding about...or at least thought I did. But, the more I read the more confused I get. Sifting through the BS is sometimes the hardest part. So, in no particular order, here goes...keeping in mind I’m referring more to mild to hot street builds or mild racing mills, not full on race applications. When an engine is bored, they are usually cut to what, about .003” under final dimension? And then honed to final size with a rigid hone with preferably a torque plate attached? My understanding is that this part of the honing process is usually done with somewhere in 220-280 grit range with a rigid hone, then followed up with a few passes with a much finer hone, generally about 400 grit, and then possibly finished with a nylon brush. From what I have read this is pretty much universal for cast or moly rings in a freshly bored block. Does this sound right? Is the final hone done with a rigid hone, or a dingle ball (or flex) hone? Rigid hones...would there ever be a need for a home engine builder to use one of these? I have read that these are used to help straighten a worn cylinder, but if it is bad enough to need taper removed, shouldn’t it just be bored? Couldn’t you potentially do more damage with a rigid hone? 3 legged hones...these are just for initially “roughing up” a used cylinder, correct? Just to be used as an initial prep when re-ringing a used cylinder that has been polished smooth by previous useage? Flex hones (or dingle ball hones)...these would be used as a final surface prep, correct? Whether it was a fresh or a used cylinder? These hones are commonly available in everything from 180 grit to 800. How do you determine which is the correct one (or combination of) to use? Let’s take this scenario...a .030” over 350 Chevy with 20k miles on it, no or bare minimal ridge. Replacing the stock replacement cast pistons with something more performance oriented. Bored still have a visible crosshatch. Since the bore isn’t freshly bored, how would you prep the cylinders for a fresh set of cast rings? Rebuilder type moly rings? Plasma moly rings? Which would be better for a good, but not freshly bored bore? I always leave about .005-.006 for finish honing as not all bores will clean up perfectly with only .003 to finish to size. If you have a ridgid hand hone that will work fine it just takes a while and you have to be consistent with your stroking. dingle ball hone to break the glaze for new rebuilder rings and different pistons will work OK if the bores are round enough. When I show my students about honing, I show them both kinds, ridged and flex hones. If your bores are true, flex hone is all you need. What I do and what I show them is, if your lazy and want to find out if your bores are true without measuring, slip a ridged hone in it and stroke it a few times, you will see every bit or area that is either out of round or tapered, because the will be no scratches in the worn parts. So then you have to get out the measuring tools. I don't do boring on my engines either, but I usually use a plateau flex hone after the machine shop is finished. Seems the leak is better and the rings seat fast by using this method. When a real pro is honing with diamonds, he doesn't always change the head to the Sunnen plateau hone. A quick hit with a flex hone such as this usually seats the rings. Would this be considered more of a “glaze breaker”, instead of a finishing tool? Why the heck would you use plain cast rings in a performance build? You don’t necessarily even need to hone the cylinder, but a 180 or 240 grit flex hone is good. I’m too lazy to type “how to hone 101” again. There is lots of info in the archives. right in the neighborhood of 200 grit aluminum oxide is used as the base finish MOSt cases, because this gives about the right valley depth and size for lubrication. Has to do with oil. Then usually go over that with a limited number of strokes of some finer abrasive, just evening the peaks, not enough to actually reach near the bottom of the base finish. If done IMMEDIATELY, within say, in ten minutes, you can do this by switching finer stones into the hone head. The cylinder is never straighter than just after you finished honing it. 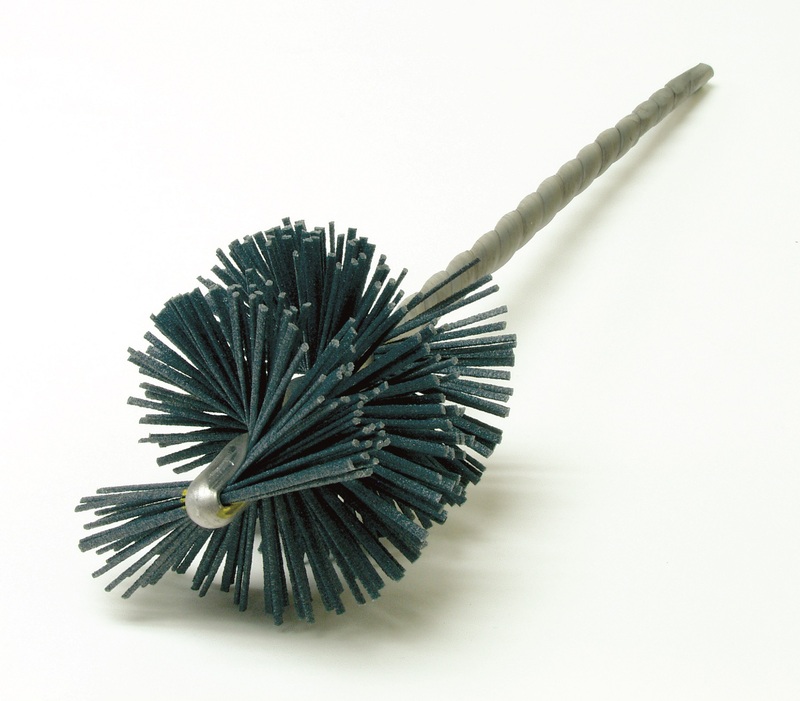 If you want to do that LATER then you will need a flexible abrasive brush of some kind to do it. My thought is if your machine shop does not own and working profilometer and does not know how to use and benefit from one --FIND A NEW MACHINE SHOP TO DO YOUR HONING! Bored still have a visible crosshatch. Is the cross hatch bright, or dark brown lines of baked in oil? A piece of worn oiled WetorDry, 200 something grit, on the end of my finger. 20 k miles on a 350 chevy with 5/64, 5/64, 3/16 stock style ring package would definately wear the bores a measurable ammount at the top and bottom of ring travel. If your replacement "performance" pistons locate the rings a bit higher up towards crown (like most race pistons do) then your top ring will be running over the speed bump and upsetting it. If you were putting exact same pistons, rods, crank,etc back in, then ball hone. If changing pistons or anything else that would also change ring travel path, then rigid hone with tq plate for best results. If resulting p-w clearance will be excessive then go to next oversize. BTW, the right grit ball hone actually leaves a very good finish for new rings. Yes, we have confirmed with my profilometer. What is every bodies thoughts on finishing with a fine ball hone run in reverse direction, to take the scales off? Running ball hone in reverse for a few strokes works well for knocking off some of the folded over bore material. So in this particular situation, I have a .030 over 350 sbc with 4vr flat tops way down in the hole (average.053” ) and basic cast rings. There is a little bit of scuff marks in the bored but you can’t feel them. I want to freshen this thing up, including decking. The ridge you can just barely feel. If I wanted to reuse the pistons but change to a decent moly ring, what would you hit the bored with? A 240 dingle ball followed with a few passes with a 400 dingle ball? It’s more of a curiosity thing, because most likely it’s going to get a set of lightweight 2vr forged flat tops and a lot tighter quench (plus better heads, cam, etc). The reason for the more general, vague questions is because I have a few other projects in the works that are just low buck drivers. One is a 301 Pontiac that I have been procrastinating hard on...honed with what looks like was 40 grit sandpaper, with chrome rings. 800 miles since it was rebuilt and still burning a quart of oil every 100 miles. I didn’t build it, but it’s a friend that I have known for probably 30 years so I offered to look at it. Plus a Ford 300 I-6 and a 360 FE, both for limited use off road beaters/hunting/fishing vehicles. If you are going to redo the existing engine with new lightweight forged flat top pistons or otherwise the piston to bore clearances are going to have to be quite a bit different that your existing cast pistons and most likely honing alone won't get you there to that new clearance needed unless your existing bore size is within about .002"-.003" of what the new forged pistons will need. You could go with 4032 hypereutectic light weight pistons like Mahle offers in their kits with the newer 1.5,1.5, 3.0mm ring sets depending on what you will be trying to do with the new engine. I am surprised the existing pistons are down the holes -.053". That's not a good place to start. Don't cut the deck until you determine more closely what the compression heights will be on your new pistons and existing rods. Then they need to get the assembled setup close to a range of -.010" to .000" for a deck height and set a decent quench with a good head gasket set thickness. Make sure your shop can bore and hone with deck plates and that they can finish and plateau hone the bores to the ring manufacturers recommendations for RVK, RK and RA. This is where the profilomenter needs to be used. DON'T USE SYNTHETIC OIL FOR BREAK IN! Or any crazy slippery additives! Use a good premium conventional oil with good additive wear package for break in and change the oil and filter out shortly after a short running use and then cut open the filter and look for any substantial size debris or metal fragments. As for that sad description of the bores and rings in that Pontiac engine. Even with a new set of chrome rings on a good bore and hone this engine would and should never use (burn) a quart of oil in 100 miles even with the slightly longer break in that can occur with chrome rings.!! My call would be that engine has to come back down, set the bore clearances and finishes with good careful honing again as per recommendations of the ring manufacturer and start over. Not the easy answer but that's the reality most likely. Time to buy a dial bore gauge and measure the cylinders. i can see a limited range of cases where using a flexy hone would be better..... if the cylinder is out of round and tapered lets say .002", such that the rings would still work fine, but too warped to use a rigid hone because if the bore was enlarged .002 the cylinder clearance would too loose, and we aren't going to knerl pistons nor source larger ones. MAYBE you are in that category, but....... why don't you find out? The reason we don't know a lot about what to do in this case is because honestly it does not happen very often.